You may have seen already on my instagram that I done a tiny review on these products already but I loved them so much and I thought I would do a more detailed one about them all as it was requested by a couple of you. 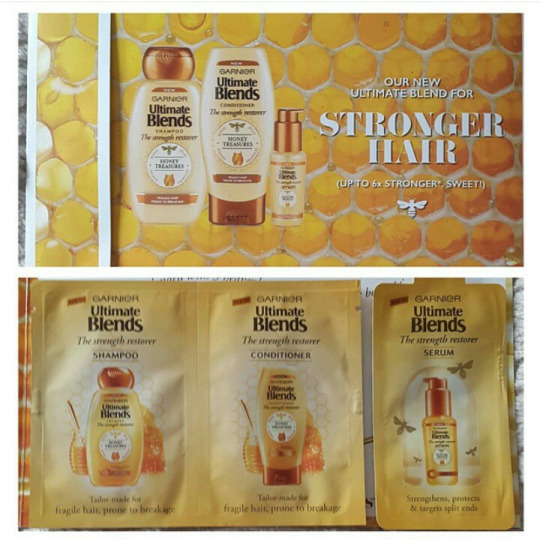 A couple of weeks ago Garnier got in touch with me and asked if I would like to try their New Ultimate Blends Honey Treasures and Honey Bee Propolis products, since I've never heard of them before (probably because they were new), I said yes. It took around a week or so to arrive and although they only sent me sample sizes I was thankful for them anyway. If I'm doing a review product I usually like at least getting two sample sizes so I can test the products out properly and give a better review. "Ultimate Blends Strength Shampoo is tailor-made for fragile, damaged hair. A powerful blend, enriched with 3 ingredients from the beehive: Honey, Royal Jelly and Propolis. From the first wash hair feels healthier and breakage is visibly reduced, wash after wash hair feels stronger." "Keeping your hair in shape is now super easy with Ultimate Blends The Strength Restorer tailor-made for fragile, damaged hair. 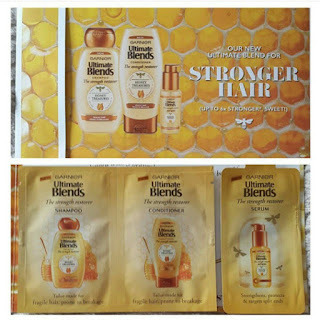 Our powerful Blend enriched with Honey, Royal Jelly and Propolis, leaves fragile, damaged hair feeling healthier and more resilient from the first wash."
"Use The Strength Restorer Shampoo for heavenly honey scented hair and follow with The Strength Restorer Conditioner for hair that feels stronger and looks healthier, wash after wash. For hair craving intense care, try The Strength Restorer 1 Minute Treatment. In just one minute, hair feels intensely nourished from root to tip and revitalised with a feeling of new strength." 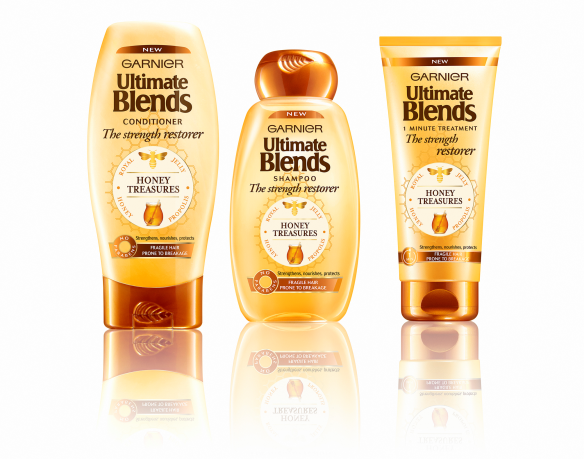 "At Garnier Ultimate Blends we have spent seven years, working with over 25,000 British Women to create a new range of haircare products tailor-made to tackle the unique hair problems that Britain throws your way. Each of our powerful high performance blends is carefully crafted with natural sourced ingredients and cares for British hair." I was unsure at first but I have to admit, as the shampoo made my hair feel brittle and damaged and that's exactly the opposite of what it's supposed to do, but after using them all now and styling my hair - I love them! I'm not a massive fan of the smell, as it's really strong I found and I'm not the biggest fan of honey, but I love how light my hair feels. Because I did only use these products once I can't give an amazingly detailed review, sorry guys!, but from what I did use of them I know I am going to be buying more of these products to give a proper go of, and I would advice all of you to do so to try it out. You can buy these products at your nearest boots, superdrug or most supermarket stores. I hope you all enjoyed this blog post. 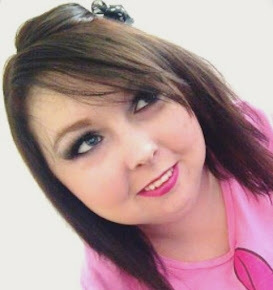 Don't forget I'm putting up a new blog post every day this summer so make sure you come back tomorrow to see what tomorrow's blog post is going to be all about?